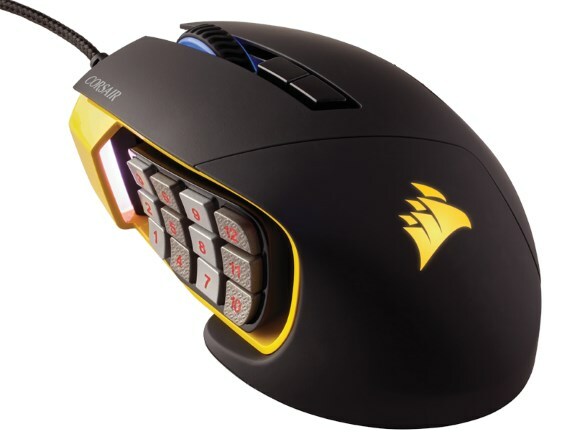 Corsair shows off the Scimitar RGB, a new mouse designed for MOBA gamers. This peripheral hits the market in September for $79.99, it has a 12,000 dpi sensor, 12 extra mechanical buttons and a key slider macro button control system to slightly adjust the position of the extra buttons. The mouse taps into Corsair's CUE Link system for synchronized colors and effects and promises to fit the contour of palms of any hand size or grip style for maximum comfort. Rounding out the lineup, the SCIMITAR RGB gaming mouse improves the MMO/MOBA experience with its exclusive patent pending Key Slider™ control system. The innovative system provides 8mm of adjustment, putting every button within reach of most gamers’ thumbs regardless of hand size for improved comfort and accuracy. The 12 mechanical side buttons were designed with pro player specification in mind, delivering ultra-consistent, tactile feedback and actuation. The pro-proven 12,000 DPI high performance optical sensor provides pixel-precise gaming performance. The SCIMITAR RGB also utilizes Corsair’s one-of-a-kind CUE software, enabling gamers to customize mouse sensitivity, buttons functions, and lighting, as well as program advanced capabilities such as custom timer countdowns, double macros, and much more. CUE Link connects Corsair RGB keyboard, mouse, and headset to deliver a full spectrum of synchronized colors and effects.